Securely control power on/off/reboot to a server, router, web cam, firewall or other remote devices over IP. 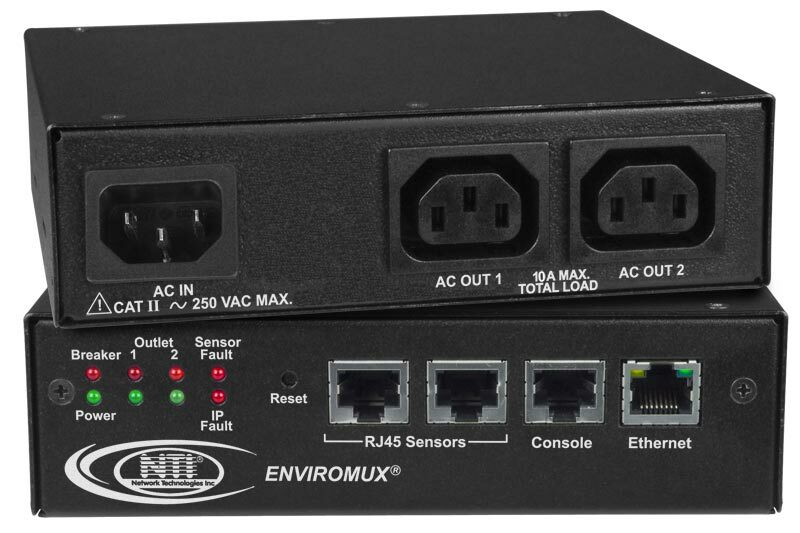 The ENVIROMUX® Secure Remote Power Control Unit allows you to remotely reboot and control power (on/off) to two servers or other powered devices from any location via secure web interface, RS232, SSH, or Telnet. Manual – select the outlet and turn the power on/off. Scheduled – set date/time/duration of power cycle. Associated – power on/off a device when a sensor goes out of range of a user-defined threshold, or reboot unresponsive IP devices. Security: HTTPS, SSHv2, SSLv3, IP Filtering, LDAPv3, AES 256-bit encryption, 16-character username/password authentication, user account restricted access rights. Configure, control and monitor the unit via Web interface or Command Line Interface (CLI). Up to 3 additional IP aliases can be configured to allow remote control of the unit using different networks. No scripts required - simply add the IP address, network mask, and gateway configurations through the web interface. The first network (default network) will be used for total control of the unit, i.e. inbound and outbound connections. The three other networks will allow web/SSH/telnet access only, i.e. inbound access only. Up to four separate networks can be plugged into a network switch that is linked to the unit to facilitate the configuration. Supports two environmental sensors, including: temperature/humidity and water detection. Shut down power when high temperature and other environmental threats are detected. Monitor (ping) up to eight IP network devices. Sends alert notifications via email, syslog, LEDs, Web page, and SNMP. Automatically configures network settings received from a connected DHCP server. If a DHCP server is not found, the default static IP address will be used. Integrates with various Open Source monitoring packages - Nagios and MRTG. Features Normally Open (NO) relay contacts. 90 to 250 VAC at 50 to 60 Hz. Two RJ45 modular jacks for connecting NTI temperature/humidity and liquid detection sensors. One 10/100 Base-T Ethernet port with RJ45 Ethernet connector. One female RJ45 port for terminal access. Storage temperature: -13 to 149°F (-25 to 65°C). Operates and configures via HTTP/HTTPS web page, Telnet, SSH, or RS232 interface. Alerts are sent using email, syslog, and/or SNMP traps. Configure, control and monitor via HTTP/HTTPS webpage. Configure outlet operation settings, sensor thresholds and timing, alarm methods, alert formats, sensor/IP device outlet association, and system data log. Add up to 3 additional IP aliases that allow remote control of the unit through different networks. 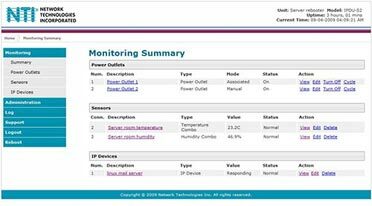 View outlet status, sensor values, IP device values, and alert status on one summary page. View, Edit, Turn On/Off, Cycle buttons for each power outlet. View and Edit sensors and IP devices. View entries stored in the system logs. Event log records system events such as alerts, user login/logout, failed email messages, etc. Data log records samples of sensor readings. User specifies sampling time period. The log can be downloaded as a tab-delimited plain text file. Configure IP information, SMTP settings, SNMP settings, IP filtering, and user administrative settings. Administrate up to 15 users plus a root administrator. Configure permissions, schedule and alert methods for each user. Configure, control and monitor over the text-based menu system accessible via RS232, Telnet, and SSH. "POWER" (green) – indicates device is powered. "OUTLET" (green / red) – outlet is on or off. "SENSOR FAULT" (red) – lights up if a sensor goes out of range of a configurable threshold. "IP FAULT" (red) – lights up if an IP device is unresponsive. Using Multi Router Traffic Grapher. 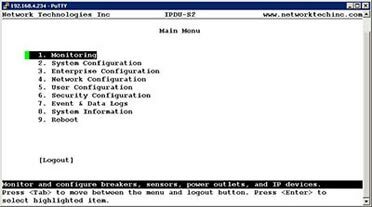 Up to 3 additional IP aliases can be configured to allow remote control of the IPDU-Sx using different networks. This set-up provides a redundant path in case of a network failure. No scripts are required–simply add the IP address, network mask, and gateway configurations through the web interface. The first network (default network) will be used for total control of the IPDU-Sx, i.e. inbound and outbound connections. The three other networks will allow web/SSH/telnet access only, i.e. inbound access only. Up to four separate networks can be plugged into a network switch that is linked to the IPDU-Sx to facilitate the configuration.